Are you moving to the Czech Republic and know nothing about Czech visas and permits? Then you are on a good address, because we prepared for you a definitive guide regarding information from moving to the Czech Republic up to obtaining permanent residence. (All information written here are especially for third country nationals.). Are you a third country national? A third country national is a person whose state is not a member of the European Union nor these states: Iceland, Liechtenstein, Norway, and Switzerland. Members of the European Union: Czech Republic, Slovakia, United Kingdom of Great Britain and Northern Ireland, Malta, Romania, Hungary, Finland, Portugal, the Netherlands, Germany, Greece, Denmark, Latvia, Lithuania, Cyprus, Luxembourg, Italy, Ireland, Croatia, France, Poland, Estonia Austria, Slovenia, Sweden, Belgium, Spain and Bulgaria. 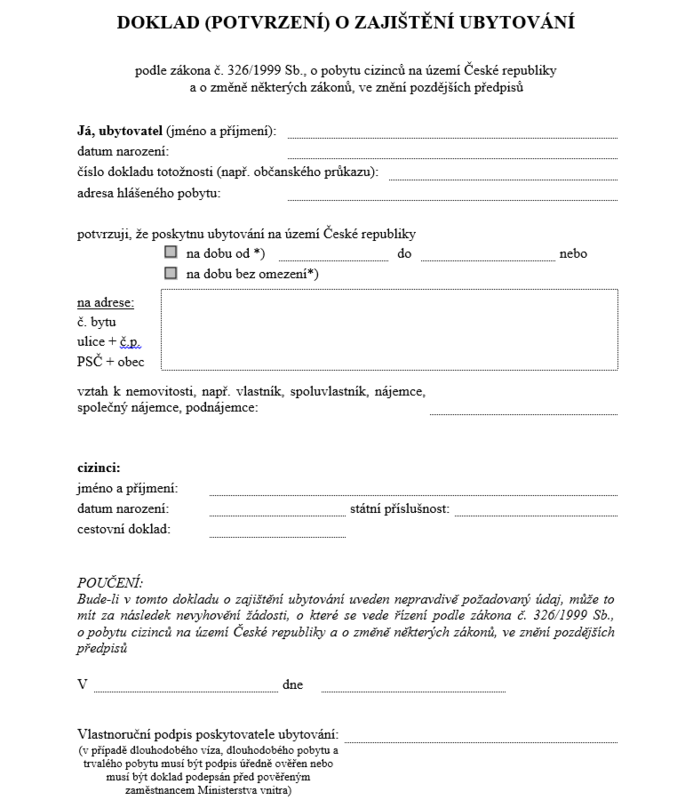 The Czech legislation specifies more types of residence for foreigners in the Czech Republic. The first type specified is the short-term residence determined for ninety days stay. 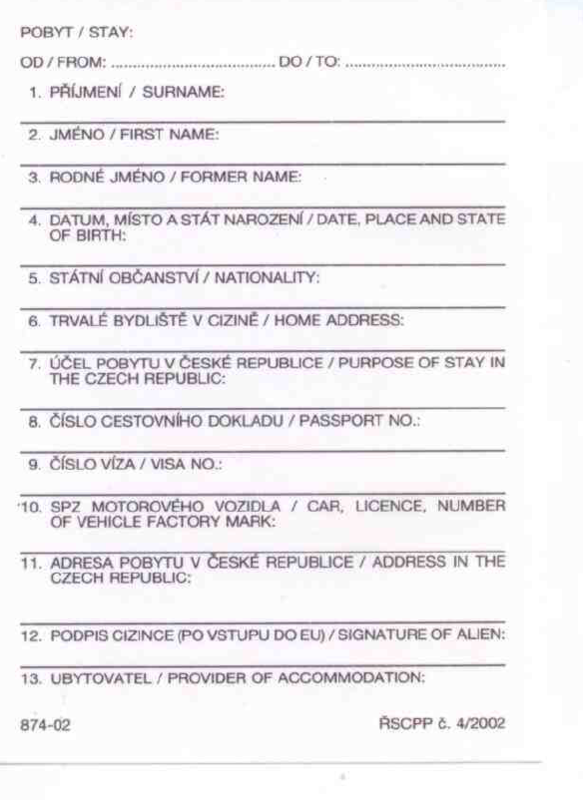 Another one is the long-term visa and long-term residence for more than ninety days and as a last one permanent residence for citizens, who have decided to stay in the Czech Republic. Every third country national, who comes to Czech Republic is obliged to report his presence at the appropriate department of Foreign Police. It has to be done during three days after the arrival. Addresses of single police departments can be found here. For fulfilling the report duty it is necessary to have the valid passport and filled registration form, which you can find in every Foreign Police department. 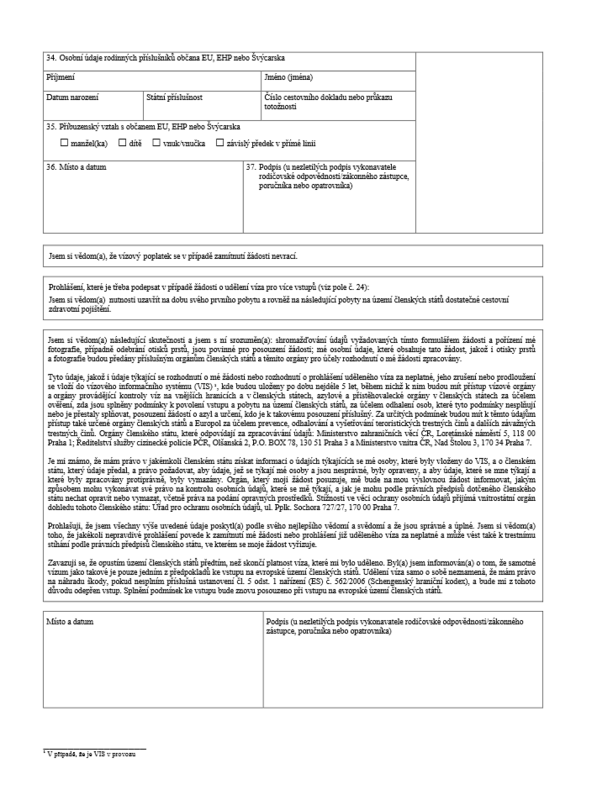 A police officer is authorized to ask you to submit the valid travel health insurance with the proof of his payment. When am I not obliged to report my presence? The report duty of presence is not related to people younger than 15 years and for people who have satisfied this obligation their accommodation provider. Note: If you are accommodated in the hotel, your report duty has to be satisfied by your hotel. Short-term residence is residence for less than 90 days in every 180 days. The beginning of residence is counted on the day of the arrival check-in and contrary day of the checkout is counted as a last day of your residence. It is important to note that the period of single residences in the Schengen area of other states is summed with residence in the territory of the Czech Republic. So, every citizen is obliged to leave the area at the last day of trip, when he fulfills the condition to not exceed 90 days. Short-term residence is divided to those not subjected to a visa requirement and those subjected to a visa requirement. Summary of the states with which has the Czech Republic bilateral agreement can be found here. Citizens of states with which Czech Republic has the bilateral agreement are not allowed to perform profit-making activity. Because for purposes of work you have to ask for a short-term Visa. The application for the short term visa has to be submitted by the applicant personally. For children younger than 15 years it has to be submitted by their legal representative. Where do I ask for a short-term visa? 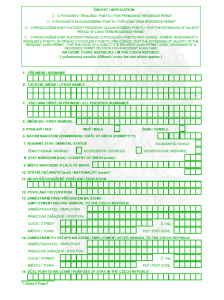 The Application for the short-term visa can be submitted in every embassy of the Czech Republic. If you plan to travel around the states of the Schengen area (for example because of scientific Conference) it is necessary to ask for a visa in the state, where you spend the longest time. When can I ask for a short-term visa? The application can be submitted three months before leaving your country. The application processing time is around 15 days. It is better to send it earlier than 15 days before leaving your country. Thus you could receive on the latest day of leaving. In the case of not being granted a visa you have the possibility to send a request for reassessing the reasons for why you didn’t pass. The reassessing form can be sent immediately after receiving the justification for non-granting visa after that you have exactly 15 days for appeal. 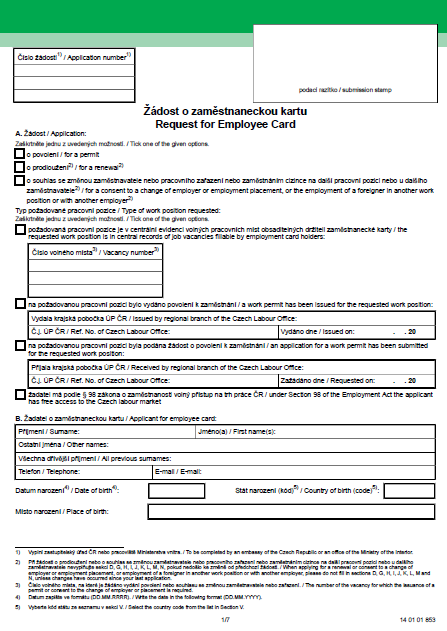 Employment – from the year 2014 this purpose was replaced by an employee card. What is an employee card? An employee card is a new type of permission for long-term residents. 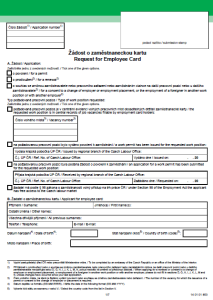 The foreigner, who is a holder of an employee card can live in the Czech Republic and also work in a company in which an employee card was issued. The employee card is a replacement for the long-term visa for employment purposes. Where to ask for a long-term visa? 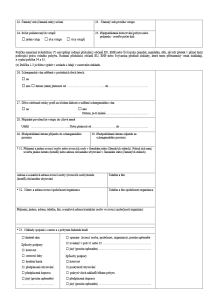 The application for a long-term visa is possible to submit at a Czech embassy abroad. The application form can be found here. When can I ask for long-term visa? The application for a long-term visa can be submitted if the purpose of your visit is still the same as for a short-term visa. It is possible to submit long-term visa from the earliest 90 days and the latest 14 days before expiration of a short-term visa. Long-term residence is determined for foreigners who intend to stay on the territory of the Czech Republic for longer than 6 months. It is important to vary between a long-term visa and long-term residence. (A long-term visa is only for less than 6 months). The application for long-term residence is issued in the form of biometric card. A blue card is the special type of long-term residence for foreigners who work where it is necessary to have a very high qualification. A highly qualified person is somebody with a university diploma or with special education which lasted at least three years. Where can I ask for a long-term residence? The application for long-term residence could only be submitted personally in the office of Ministry of Interior. (For study and scientific purposes it could be done in the Czech embassy abroad). When can I ask for a long-term residence? To submit the application for a long term residence it is only possible if you have fulfilled these three points. The purpose of your stay is the same as it was at the beginning (exemption for family reunification, scientific and study purposes and blue card). 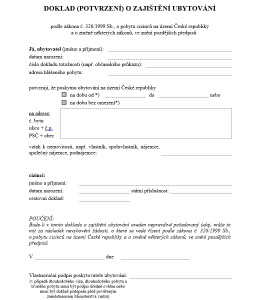 The application has to be written in Czech language or officially translated. It is also important that all documents attached must be no older than 180 days except for your passport. k) A document on travel medical insurance, and upon request a document on having paid the insurance premium. The permission to permanent residence is issued after 5 years of continuous residence. Travelling out of the country for work purposes are not counted in this time. Residence for the purpose of studying is counted only as a one half. When can I ask for permanent residence? Where can I ask for a permanent residence? 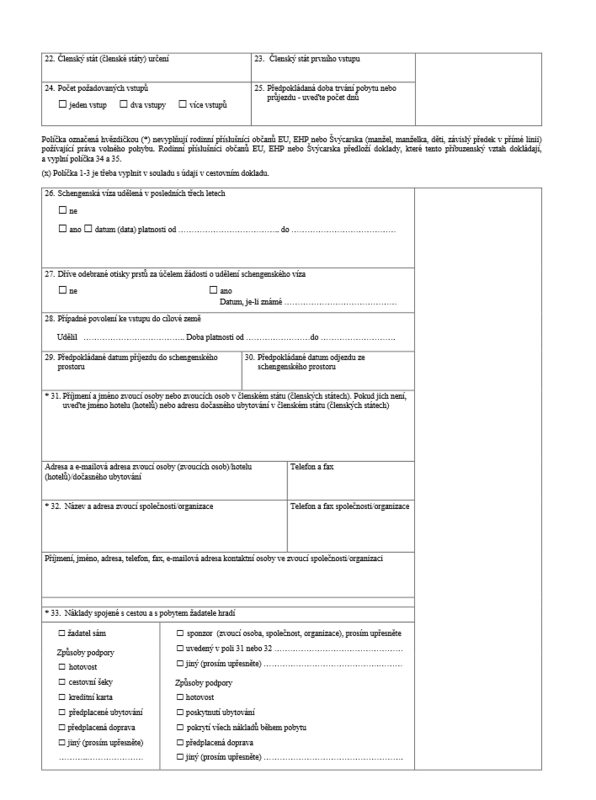 The application for a permanent residence has to be submitted at the Ministry of Interior of the Czech Republic – always personally. 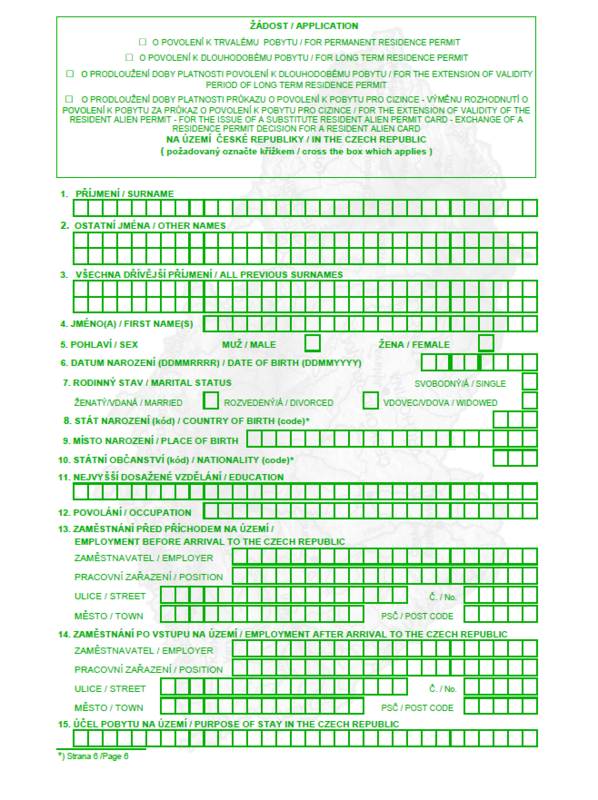 The application form for a permanent residence can be found here. 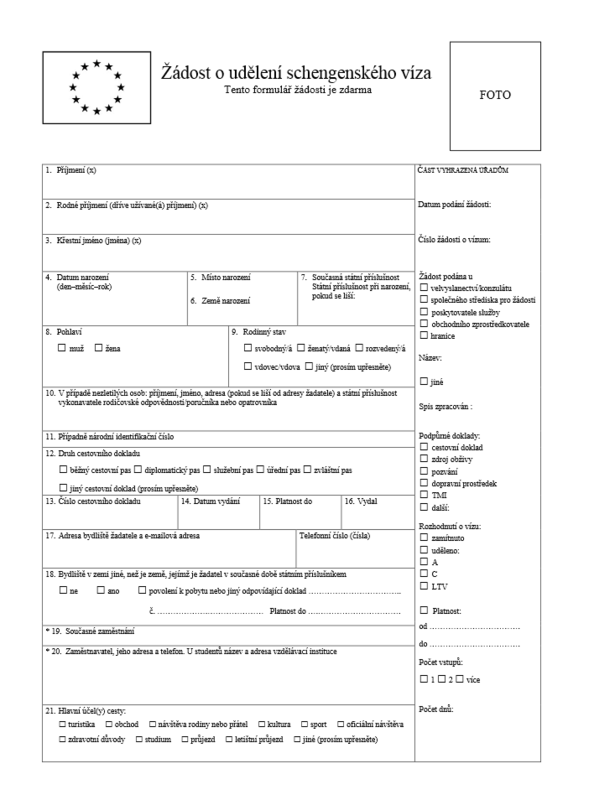 All documents attached to the permanent residence form has to be written in Czech language or officially translated. Be careful during the filling of the application because there mustn’t be any incorrect information if there were any, your application could be rejected. If the permit is approved, then you will be contacted by a worker of the Ministry of Interior. He will inform you to take over biometric card. If he couldn’t get through you, you would receive notification by post on address, which you written on the application form. In the case of not being granted a permanent residence you have the possibility to appeal against it during 15 days after receiving. The appeal has to be send via registered letter or delivered personally then Ministry of Interior makes reassessment. 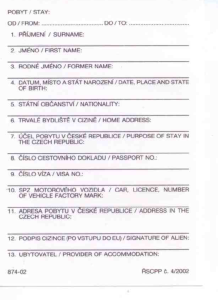 A permanent residence can be if you commit a crime in the Czech Republic or in the Schengen area. Permanent residence is also revoked if you are out of the Czech Republic for more than 6 years or more than 1 year from the Schengen area.